We would like to welcome Coach Daniel Bobik as one of three new head coaching hires for this winter season. Coach Bobik replaces Coach Troy Gibson, who retired after 14 seasons with the Bulldogs, to spend more times with his family. 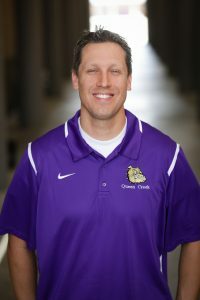 Coach Bobik is in his first year as a high school boys basketball head coach. Although just his first experience at the high school varsity level, his career as a basketball player more than makes up for his lack of coaching experience. The 6’6″ Bobik started his college career at Brigham Young University in 2001-02 before transferring to Oklahoma State in 2003. He had to sit out his first season on the transfer rule, but in 2004 and 2005 helped lead the Cowboys to back-to-back Big 12 Tournament Championships, a Big 12 regular-season Championship and a Final Four and Sweet Sixteen appearance. He went on to play overseas, before coming home to focus on his family. Coach Bobik’s Bulldogs started the season 2-2 in the Mesa Fear the Hops Tournament over Thanksgiving weekend. They have since lost three-straight to Hamilton, Tolleson and Boulder Creek in what will be a tough 6A season schedule. Their next game will be at home on Tuesday against Mesa Mountain View at 7 p.m.